I know I haven’t been as actively blogging this year. Lots of things have changed. Our daughter is now one and a half, and I have been eating (and generally spending a lot more time) at home than I did in 2010. That doesn’t mean that I haven’t been traveling and going out to eat – I have, but just not as frequently, and more often at casual places that we can go to together as a family. I have still made it to my fair share of more ambitious restaurants, just not at such a frenzied pace as in the previous two years. I have also been eating much more near where we now live (in Connecticut) rather than Manhattan – not because it’s trendy to ‘eat local’, but because it’s easier and there is actually an abundant variety of excellent eateries nearby, particularly in ethnically diverse towns and cities such as Port Chester, NY and Stamford, CT. Sometimes, you find the greatest things when you don’t expect to, and these are the best discoveries. While I still plan to keep writing on this site going forward, beginning in 2012, my words and images will also be appearing in some other places, including the ever-entertaining Arbuturian and the newly launched Bespoke Blog…so look out for my features there. 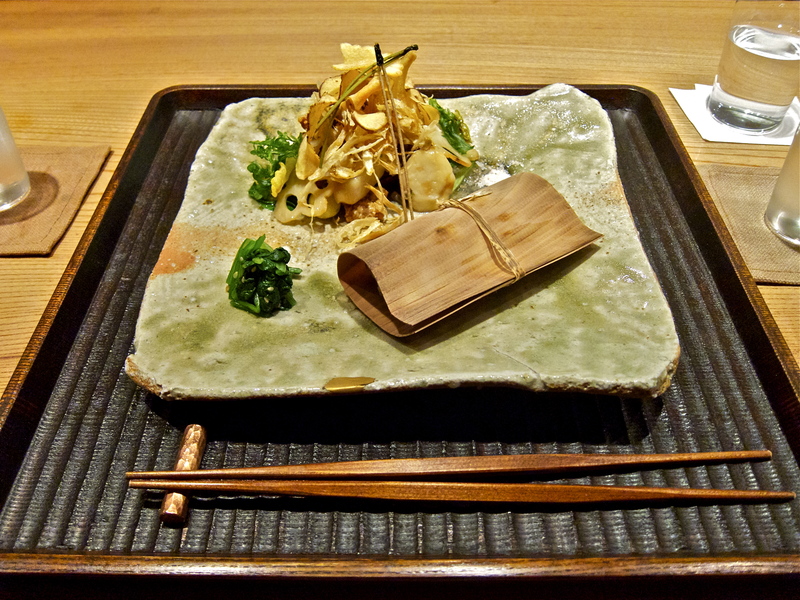 My first piece for The Arbuturian, which recounts a fantastic meal at a vegan Japanese restaurant in New York, can be found here. It is always hard to siphon down a year of eating and drinking, but I’ve tried my best to include only those dishes and drinks that were truly memorable. Hopefully I’ve gotten the balance right and you enjoy seeing both some familiar and not so familiar names in my rambling list. Given what I mentioned above, this year I am also including a segment on the food I have enjoyed eating most at home, which I hope will highlight some of the amazing farmers, growers and restaurants/food retailers we have in the Tri-State area, particularly in Connecticut. Although much of this year’s list comes from the US (as I haven’t been traveling as much), there a number of entries from the short but hugely enjoyable trip I made to Copenhagen, a longer trip to Italy (including Rome, Umbria and Tuscany) and a brief sojourn in my former home of 10 years, London. I also had some great food during my first trip to Brazil, but somehow none of it made it onto the list. Sadly, I didn’t make good on last year’s resolution of cooking more often (well, really learning how to cook in the first place). I have my wife to blame (or thank?) for that as she is so good there often seems little point in me trying. But I’m going to make it my resolution again. Maybe I will try my hand at baking since she doesn’t know how to do that. I haven’t checked to see if I have cold hands, but hopefully I won’t get cold feet. In any case, enjoy the list and, as always, please send your suggestions of new and exciting places I should try. Here’s to a wonderful 2012 ahead, and thanks for continuing to support me through another great year. PS – while I haven’t been blogging as much, I am quite active on twitter and, more recently, on instagram (username: ‘laissezfare’), so follow my tweets and picture posts on those channels as well if you so desire. Also, many of the photos below come from my instagram or un-filtered iPhone images, so apologies in advance for the inconsistency in quality. 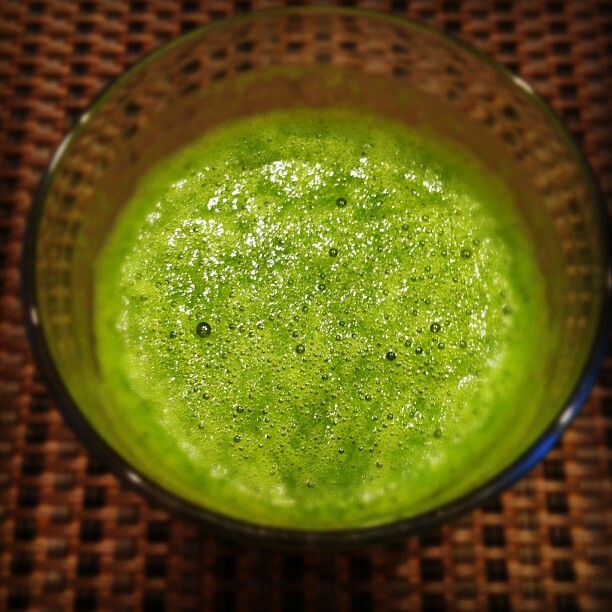 For a number of months now, each morning at Chez Laissez begins with a glass of what I have affectionately coined the ‘green sludge’. It is not as bad as it sounds, and is actually quite tasty once you get used to it. It all started when we purchased a great blender earlier in the autumn. The concoction consists of a variety of organic leaves, usually including a mixture of kale, chard and arugula (rocket), spirulina and macca powder and goji berries, with a touch of banana or apple to make it more palatable. The natural and slowly released energy boost is amazing, and it helps to ensure we get a good dose of enzymes to tackle the day. I find I actually don’t need any coffee in the morning now, but since I like it so much I still often have an espresso or macchiato – not a Caramel Macchiato, which ‘doesn’t exist’ 🙂 – once I get to Manhattan. We also recently purchased a very good dehydrator for our home kitchen, and my wife has been making all kinds of healthy and delicious snacks for us over the last few months, which you may have seen me tweeting about. We use only raw ingredients for these snacks (i.e. not heated/pasteurized) so they retain their full nutritive properties. 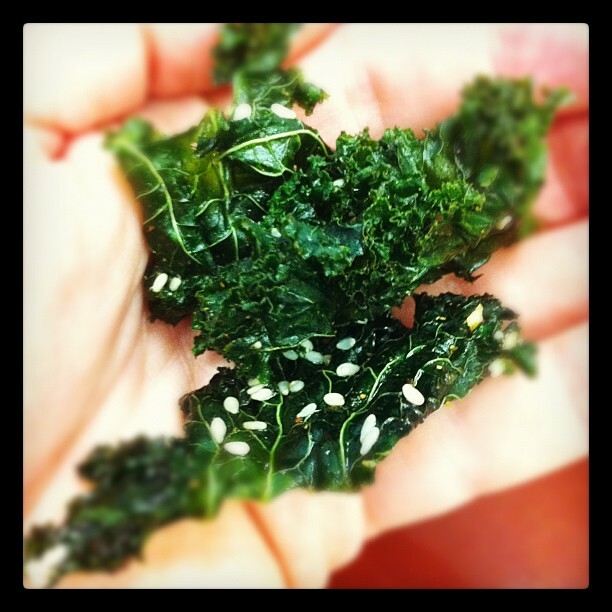 My favorites are the kale chips, for which she makes a variety of seasonings. More recently, she is also making cookies from raw cacao, coconut oil, dates and nuts (cashews and almonds), which are also excellent. We don’t eat a whole lot of meat at home, but when we do, we like to know where it comes from and how it was raised. This means we source most of it from local farmers markets. 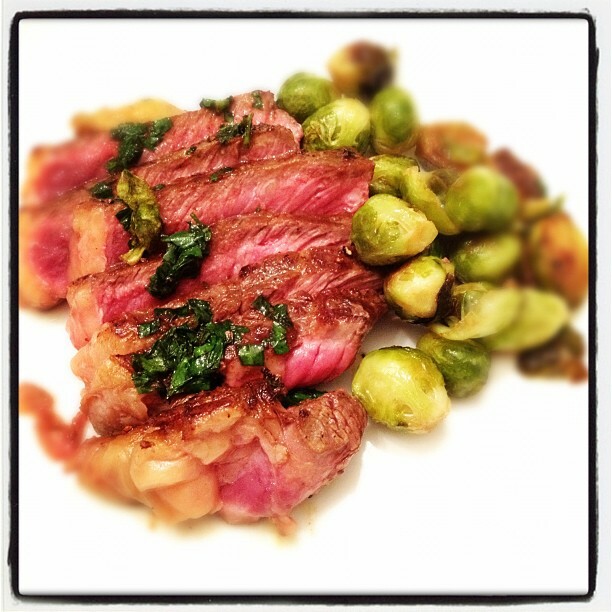 Our favorite beef comes from Four Mile River Farm, which practices excellent animal husbandry and sells dry-aged beef of very high quality at very reasonable prices. 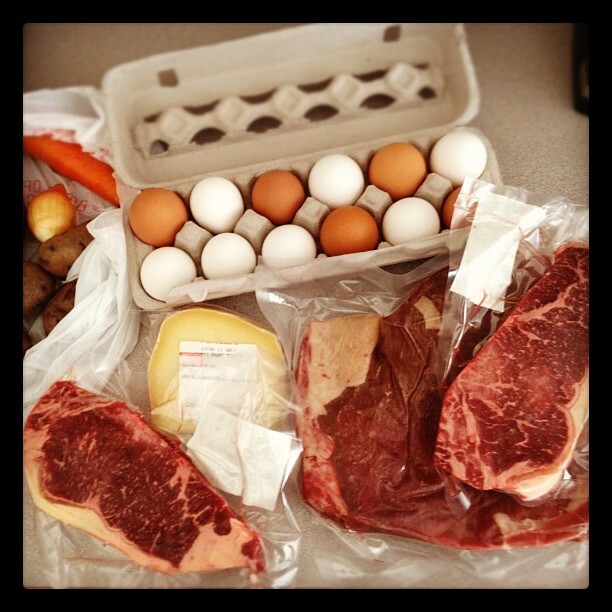 We have also bought grass-fed steaks from New York Beef, which is also good. 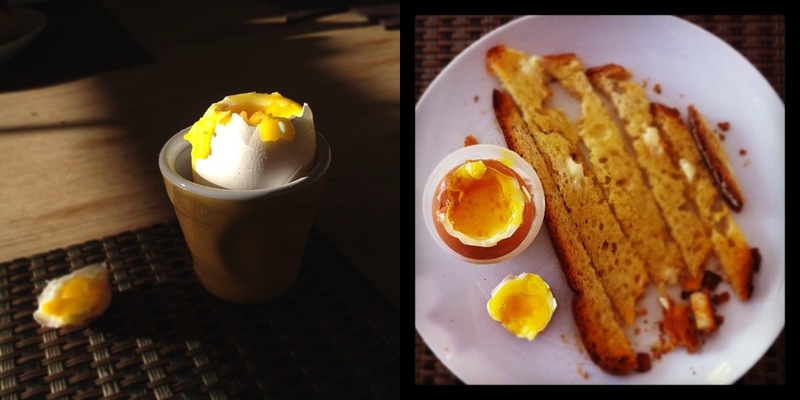 We love the eggs we get from Fishkill Farms at one of our local farmers markets. They come from pasture-raised, heritage breed hens that move in mobile coops and their eggs are downright delicious. We now buy these by the boatload, and often have them for breakfast with some excellent bread from Tarry Market, which we rate as the best bakery in our area. I have heard that they supply much of the bread to Batali/Bastianich restaurants in the NY area, but have not had this corroborated…they do have a huge facility that takes up a large block in Port Chester. Fishkill Farms also sells excellent organic fruit and vegetables (although they’re not officially accredited), which we buy weekly. Lastly, one of the best things I ate this year came courtesy of my mother-in-law who just returned to Normandy after a two-week long stay at our home. 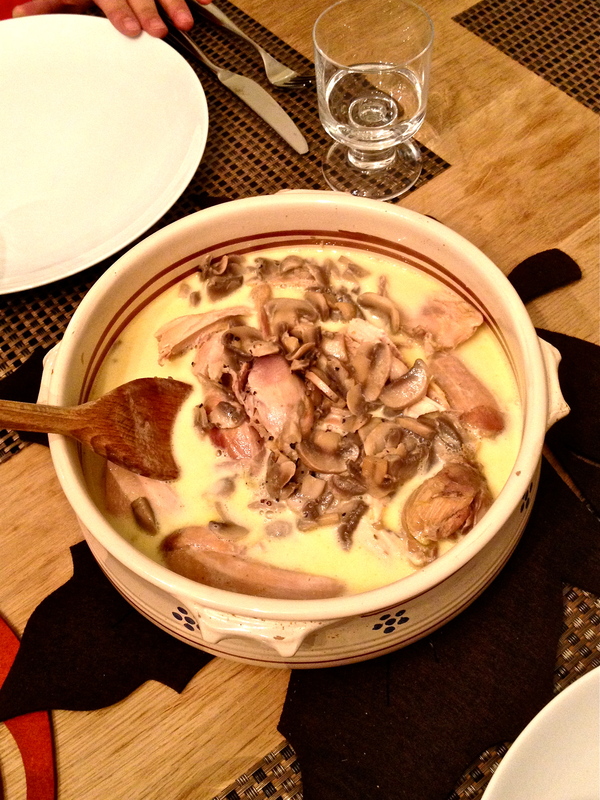 It was a traditional Norman dish of Poule au Blanc and it was simply out of this world. We bought two old hens from Fishkill Farms and she did the rest. The iPhone picture doesn’t do it justice, but the cream sauce was almost literally to die for. We had this for her 77th birthday. 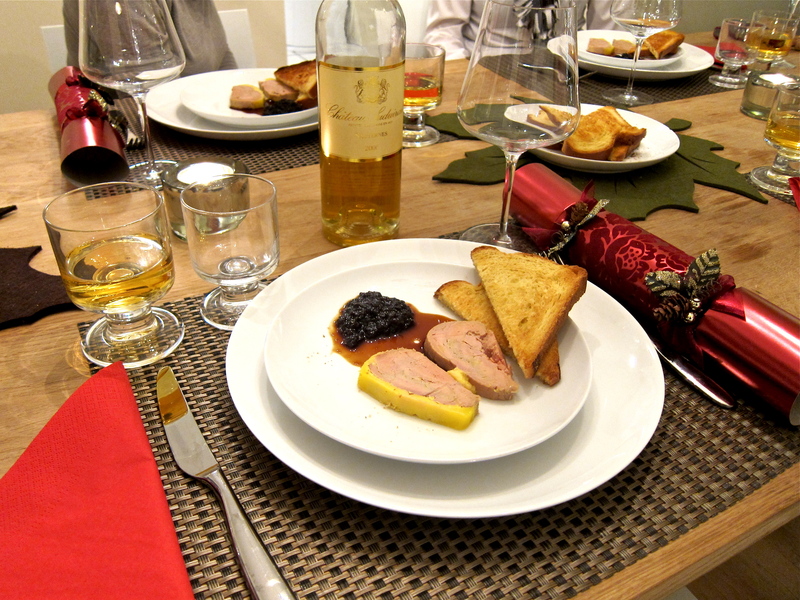 Also excellent was a house-made foie gras terrine (mi-cuit) from Restaurant Jean-Louis in Greenwich. We had this with some toasted brioche and a sweet and sour onion spread, which worked great together. The next night, she used the fat from the foie gras to sauté some fingerling potatoes – that was also something to remember. There is a Mexican restaurant named Bartaco near our house that makes you feel like you are on vacation when you dine there during the warmer months of the year. It is on the water and is designed like a beach resort of sorts. 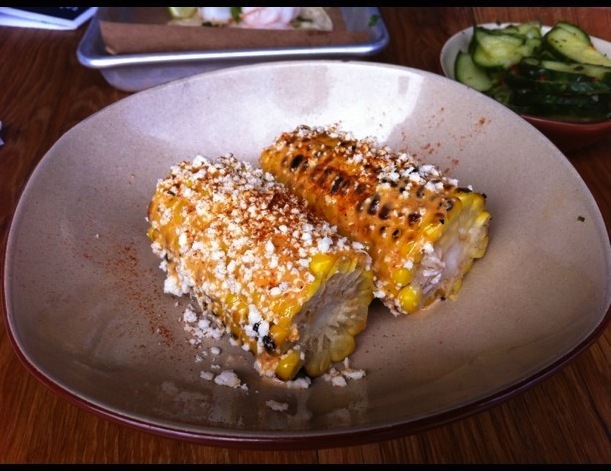 Their food is generally good, but there is one dish we always order…strangely enough, it’s a variation on corn-on-the-cob (pardon the iPhone pic). It’s about as good a version as I’ve had. Another nearby restaurant we discovered was Chili Chicken in Stamford, CT, which serves Indian Chinese food. 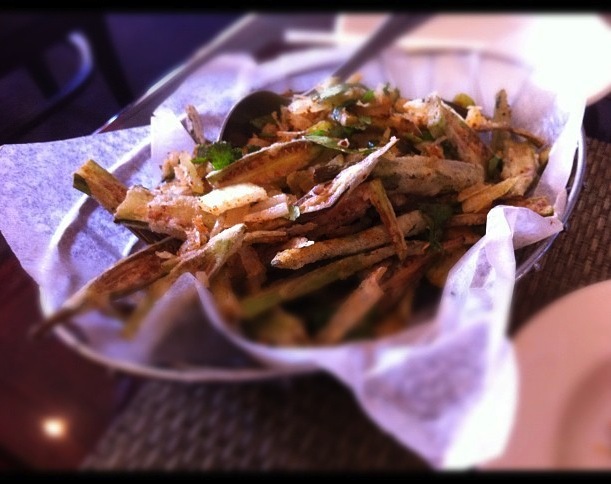 Their fried okra dish was addictive as crack (not that I would know) and is the best thing we’ve had from there so far. I was lucky enough to enjoy some very good pizzas this year, the best of which were in – go figure – Italy. 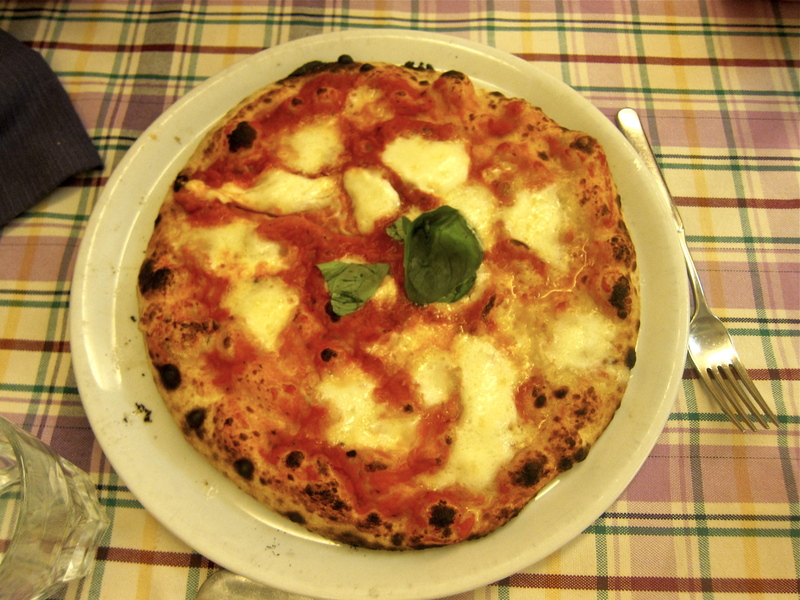 A casual family restaurant in Rome’s Monteverde neighborhood served an excellent Neapolitan style margherita. All the photos from that meal can be viewed here. At our relatively new family hideaway in Umbria, a local pizzaiolo constructed an excellent meal of at least a dozen different types of pizzas for about 30 people. The standout of the evening for me was the speck pizza, and I also enjoyed the non-traditional dessert pizza with Nutella and peaches. 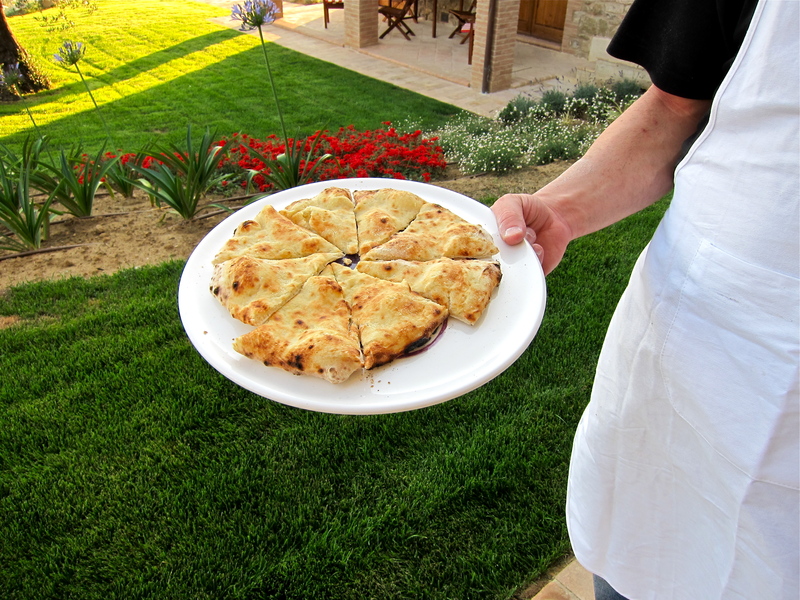 Below, you can see the first pizza he made: just dough sprinkled with sea salt and a touch of olive oil. All of the photos from this meal can be found here. While on the same trip to Italy, we had an unbelievable lunch at Arnaldo Caprai winery cooked up by Salvatore Denaro, who has to be one of the most jovial chef/hosts I’ve encountered. 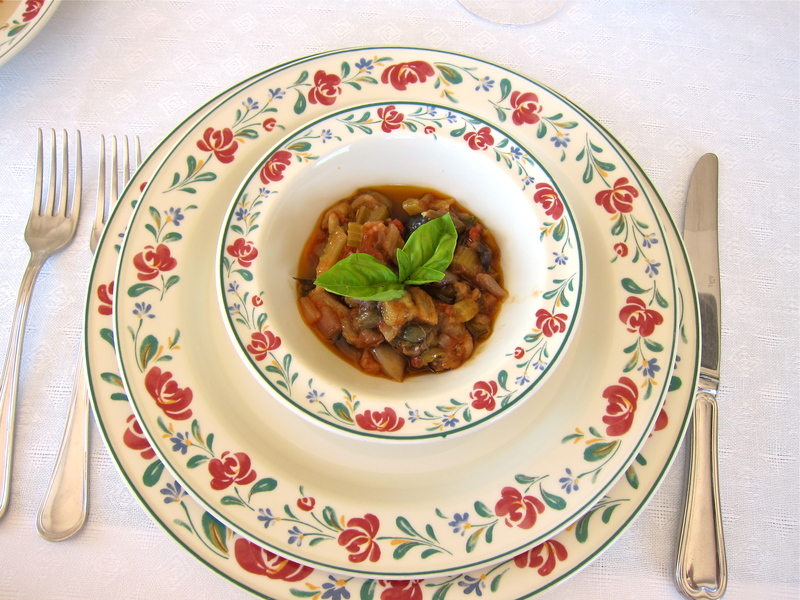 There were two courses that particularly stood out as being perfect versions of their respective dishes, the caponata and panzanella. There are tons of photos from this lunch, including some funny ones from the kitchen, all of which can be seen on my flickr set. 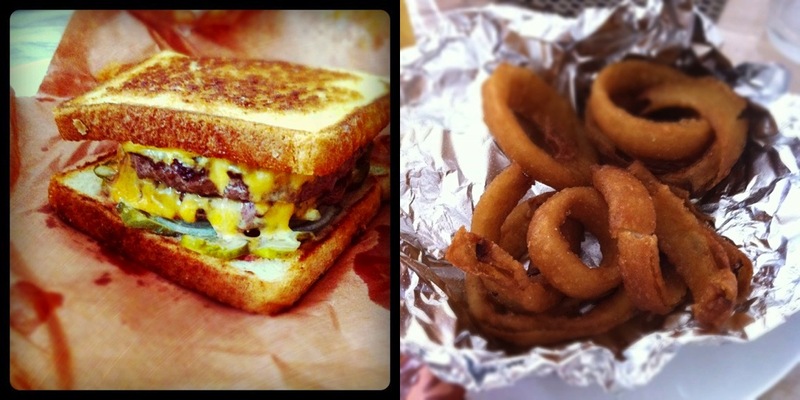 Back in the US, I also had some great sandwich-type foods this year. 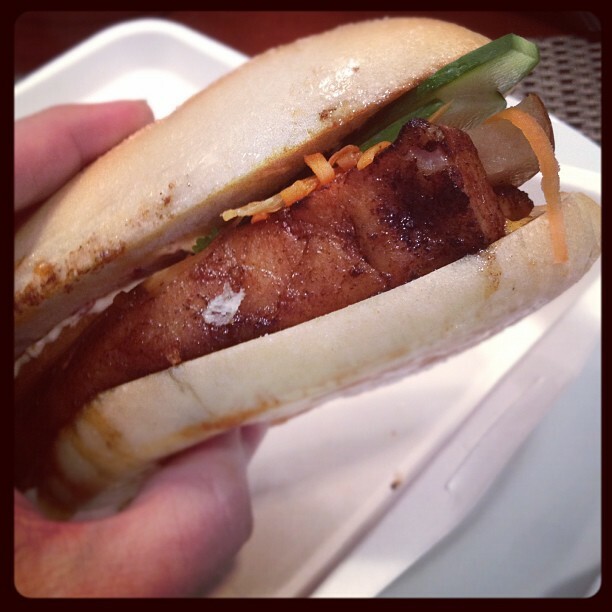 My new favorite sandwich shop in New York is the Cambodian sandwich specialist Num Pang, whose five-spice glazed pork belly is definitely a standard bearer. 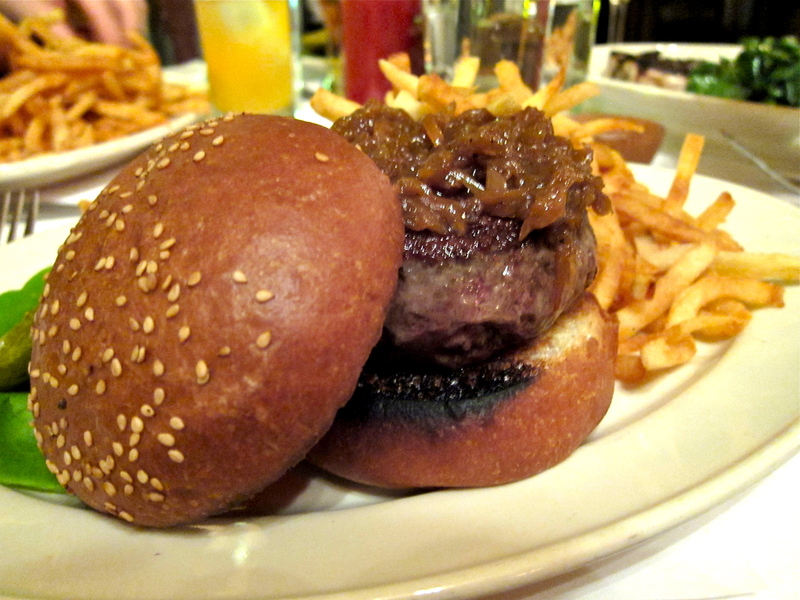 Ever late to the proverbial party, I finally had the chance to sample the famous Black Label burger at Minetta Tavern in the latter part of the year. I really can’t think of how it can be improved; it is a thoroughly conceived and rigorously executed beefy affair. Sure it’s $26 but that’s all you need to eat for the meal and it’s both perfect and perfectly satisfying. My favorite burger closer to home comes from the excellent Burgers, Shakes & Fries. Their meat is a bespoke blend from Master Purveyors in the Bronx (who supply a lot of the famous steakhouses in the Tri-State area) and is really good. The twist here is that the sandwiches are served on ‘Texas Toast’, which in this case is simply toasted bread that has been slathered with butter on both sides. After trying the various iterations, I like the single patty burger with a slice of cheese. The meat does all of the talking and doesn’t need much support. They also serve the best onion rings I have ever tasted. On a healthier note, my favorite food truck for lunch in the City is a rather new Colombian operation that serves arepas. All of their ingredients are organic and meticulously sourced. 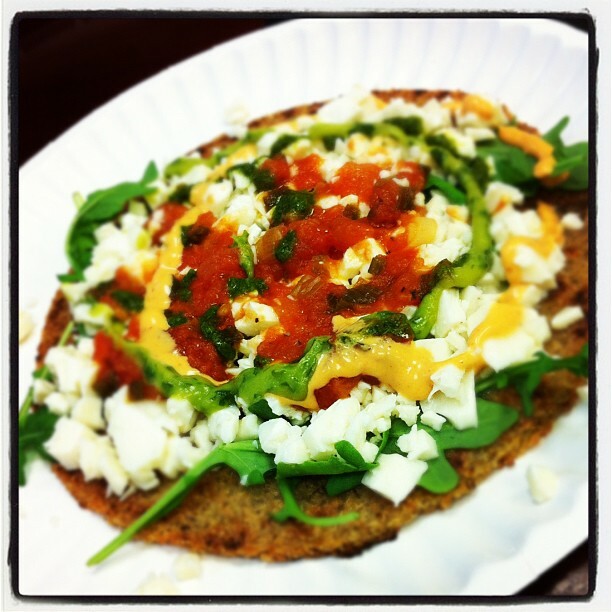 In addition to the traditional corn base, they also offer more innovative versions, for example one made with quinoa flour, and others with brown rice flour and flax seeds or sesame seeds. My favorite is the quinoa, and I either get it with just hogao and all the fixings, or occasionally a vegan ‘chorizo’ sausage (which is made from soy and comprises over 20 ingredients, including red wine for the color). They are small but if you eat it slowly it fills you up for the rest of the afternoon. Delicious. 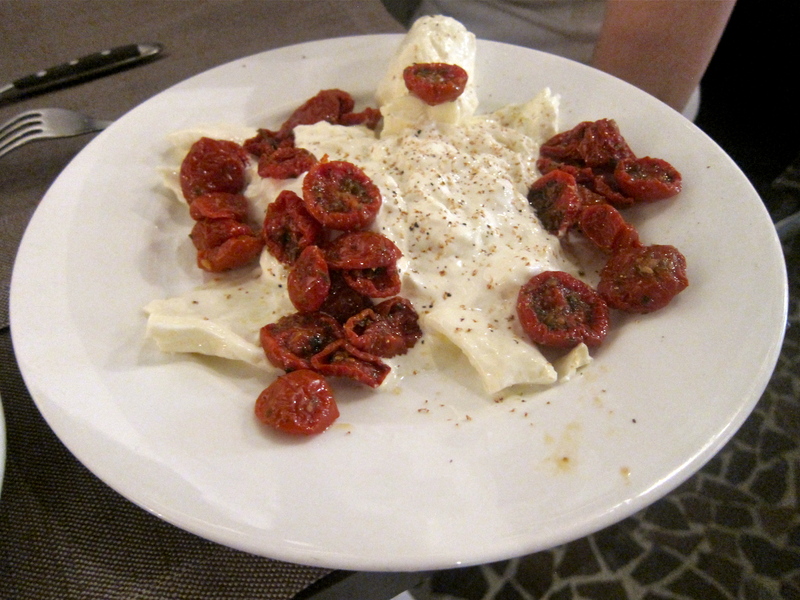 One of the best appetizers I had this year was seemingly one of the simplest, a burrata from Roscioli in Rome, which is definitely the best version of the creamy cheese dish I’ve had so far. All the photos from that excellent meal are here. Along the same lines, the ceviche di spigola (marinated raw sea bass with oil, lemon, onions, chili and fresh coriander) I had at another Rome restaurant – Osteria La Gensola – was vibrant, bright and fresh, the perfect beginning to our meal. Another wonderful light starter came from the most unlikely of places. 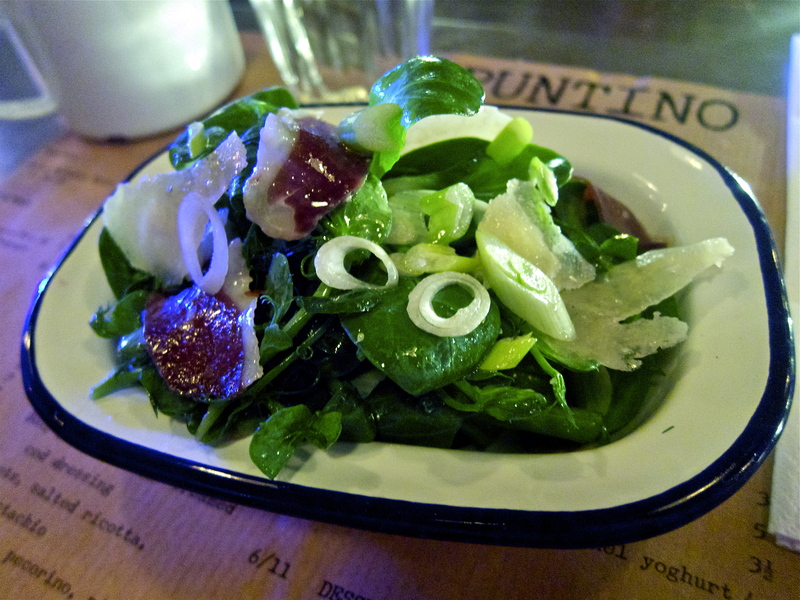 Spuntino, Russell Norman’s third of five London restaurants in roughly two years, is known more for some of its delicious yet artery-clogging dishes. But the thing I most enjoyed during my meal there was a salad. Possibly this was because it came after a few of those very rich dishes and my stomach was craving greens, but in any case, it was excellent and definitely worth ordering if/when on the menu. My review of the meal can be found here. 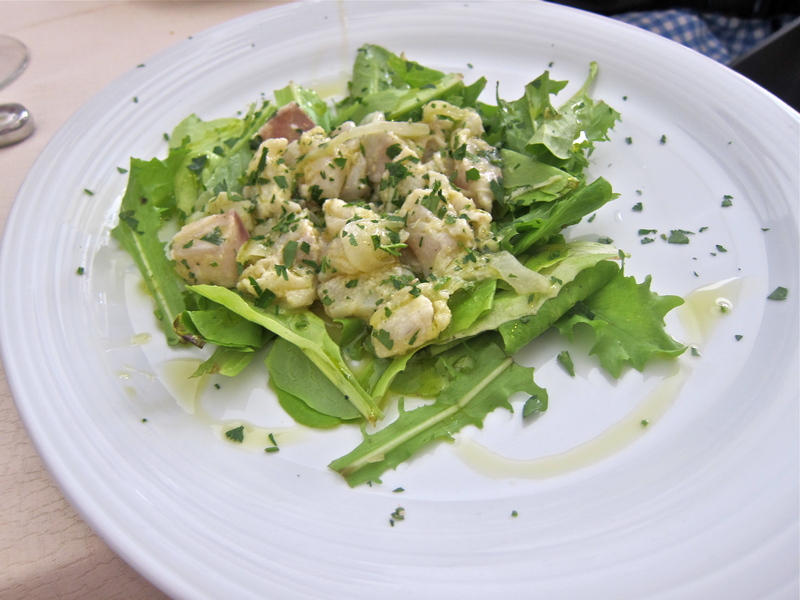 Another stand-out appetizer also hailed from Italy, although this time from a restaurant in the picturesque hilltop-perched Umbrian village of Montone. 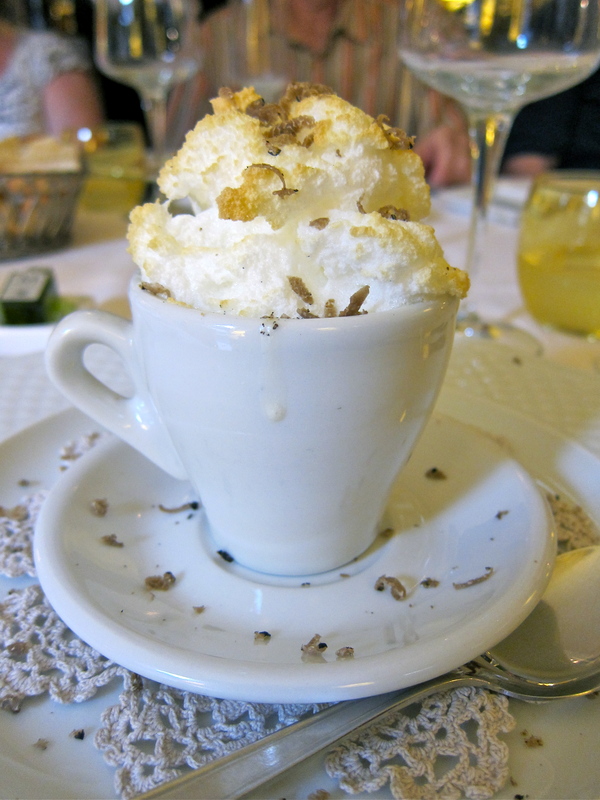 During a great meal at La Locanda del Capitano, chef Polito served his own variation on the cappuccino, which included a hill cheese fondue, a quail’s egg and fresh truffle ‘snow’. Need I say more? 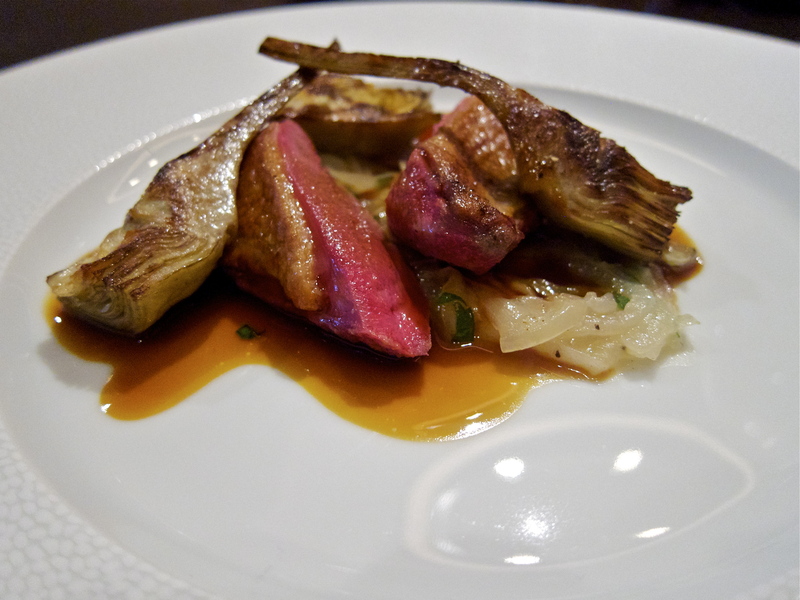 While in London during the spring, I had the pleasure of sampling James Knappett’s food at the two Michelin starred Marcus Wareing (he now cooks with Brett Graham at The Ledbury), and one dish still sticks out in my mind, both for its beautiful plating and its unique flavors. 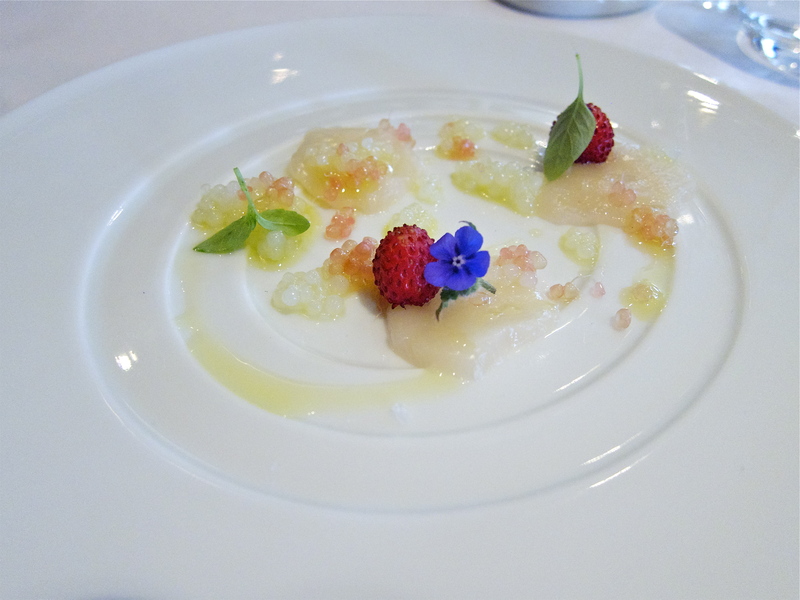 You can read more about the excellent cold, raw scallop dish I enjoyed here; it really was as pretty as a picture. The last of the lighter plates to make the list was also a cold plate, served in Copenhagen during a very cold January evening spent within the warm environs of noma. You can read a full description in my review of the meal, but the main ingredient was sea urchins – it was a breathtaking dish. There were many other things from noma that could have easily made this list (including a plate with pine branches and one centered around an intense Gotland black truffle sauce), but this was my personal favorite. 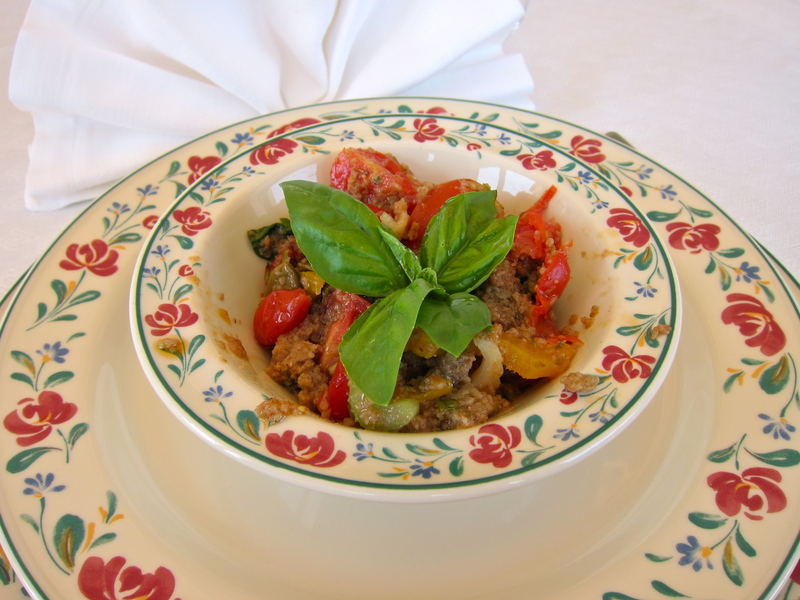 It is often difficult for the ‘main’ dish, or dishes, in a multi-course menu to stand out as the most interesting of the meal, even if they are delicious in their own right. The preceding procession of nibbles and smaller plates are designed to whet your appetite, inducing you to salivate and preparing you for what is still to come. By the time you arrive at a meat or fish course, the portion is usually more substantial and can often become too rich and/or monotonous to finish. Happily, I had a number of ‘middle’ dishes that rebelled against the odds and still live on in my memory. 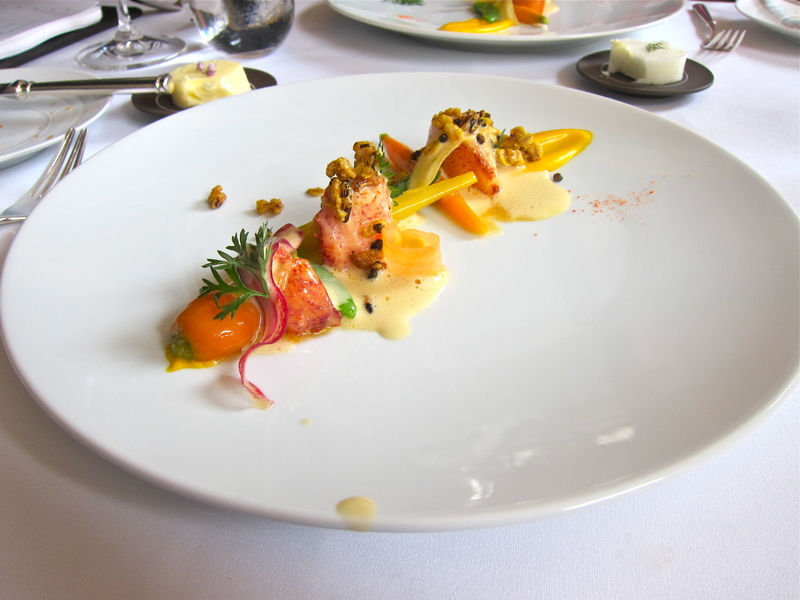 One of the best ‘middle’ dishes I had in 2011 came from a meal at Eleven Madison Park that started out great but didn’t finish as strongly (the meal was toward the midpoint of the year, before chef Humm and the General Manager bought the business from then-owner Danny Meyer). It was one of the best-cooked lobsters I’ve had and was completely delectable. We had the pleasure of dining at the chef’s table at Heston Blumenthal’s first London opening in the spring, and many of the dishes were excellent. The one savory course that stood out, however, was the pigeon. My wife doesn’t ever like pigeon, and she was licking the plate with this one. Other excellent dishes that almost made it onto the list were the Black Foot Pork Chop and now ubiquitous Meat Fruit. You can read more about the pigeon dish, and the meal as a whole here. One of the most interesting and delicious main courses I had was actually a vegetarian dish from the Japanese restaurant Kajitsu in the East Village of Manhattan. It was painstakingly plated and stood out for the variety of textures, temperatures and flavors. A full account of the meal can be found here. A diametrically opposed dish, in both spirit and substance, was equally as tasty. This came from the excellent Commerce Restaurant, which is ironically in the West Village, the opposite side as Kajitsu. While it doesn’t often get the press it probably should, Harold Moore is a terrific chef that is both generous to his patrons (he is there night in, night out and actually cares that all of his customers are well taken care of), humble in his manners and genuine in his spirit. His food strives to make you comfortable and satisfied, and it doesn’t pull any punches. Some of the best things I sampled there were his carnivorous sharing plates. My favorite was actually the lamb (and pardon the instagram image below), although the chicken is more fabled, as you can see from this Ozersky TV video. One of his classic American desserts is also included in my favorite desserts of the year…read on. La Locanda del Capitano makes its second entry with a superb main course of cinghiale (wild boar) that was hunted, killed, prepared and served by the head chef. 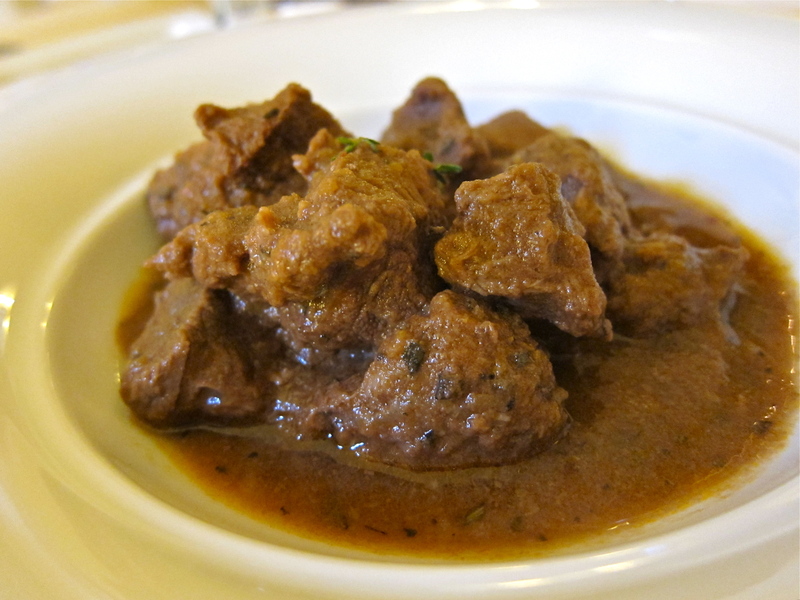 It was the best example I’ve ever had of wild boar meat, and is worth seeking out if you’re ever in the area. 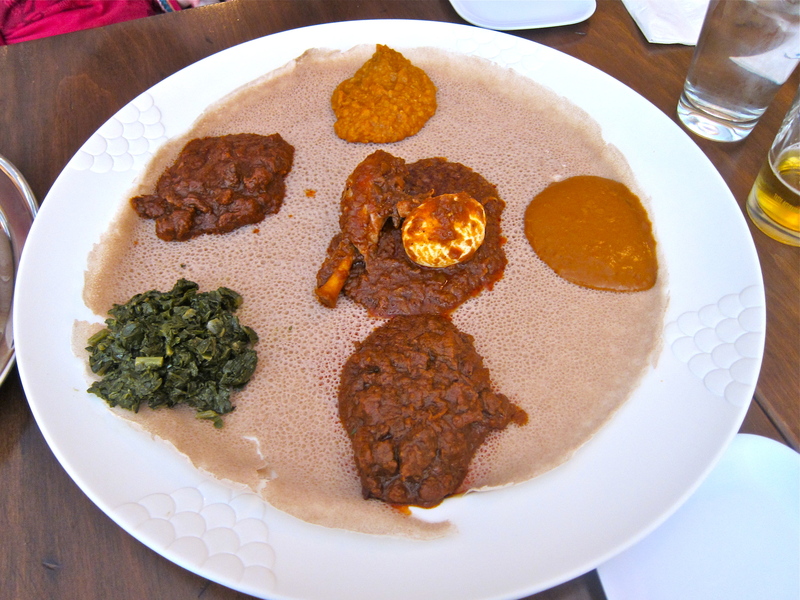 Last of the top main courses of 2011 was a pleasant surprise from a casual little Ethiopian restaurant in Westchester County, NY called Lalibela, a name shared by many Ethiopian restaurants (indeed, our favorite one in London had the same name). We had a combination platter for two, which was great for lunch. Although 2011 was a much healthier year food-wise than 2010, I managed to sample a great number of sweet treats which were totally worth the sugar and calories. In addition to some of the staple sweets we stock at home, such as Mast Brothers dark chocolate bars, we found some other great desserts in our local area. 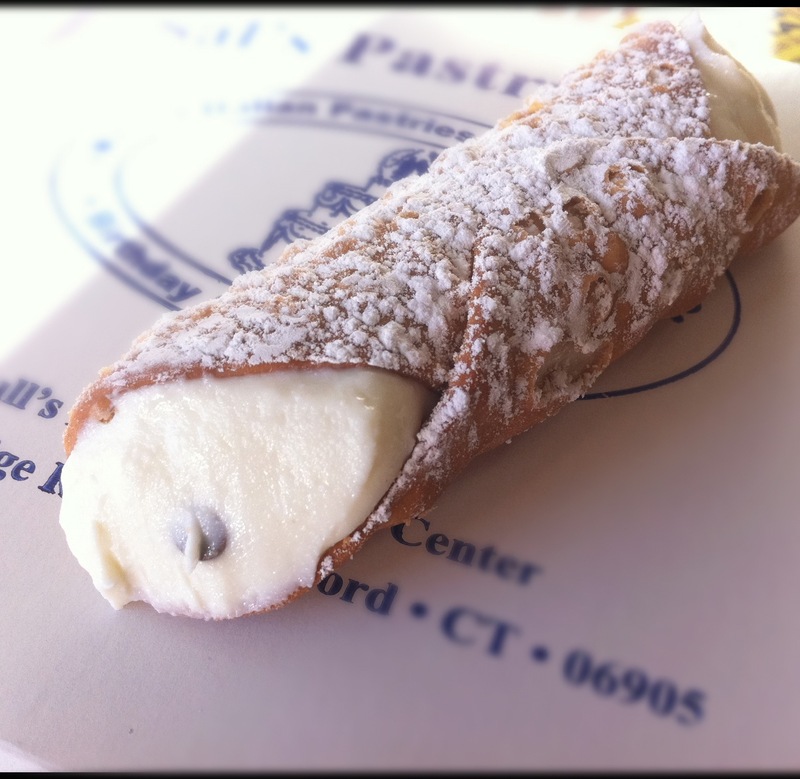 These included the best cannoli I have found in the Tri-State area (courtesy of a rapid-fire tour of Stamford, CT with perennially well-informed Jim Leff), wonderful pistachio and dark chocolate gelato from Daniella’s Gelateria in Greenwich, and also Daniella’s hot chocolate. 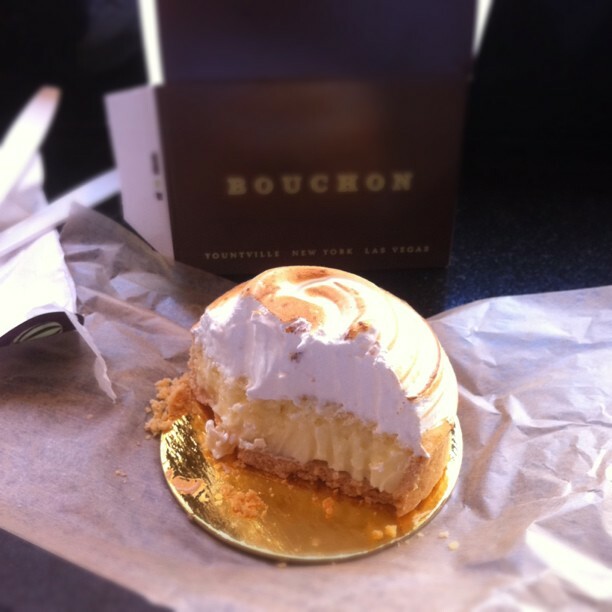 Some other treats I enjoyed outside of restaurants were from some of the better-known bakeries, including Bouchon Bakery’s classic lemon tart and Ladurée’s traditional macarons, of which the rose flavor consistently one of the best – but all are exceptional. I am glad they finally have a shop in New York, although they may still be working out some kinks, as there seem to be variations in quality from many reports. 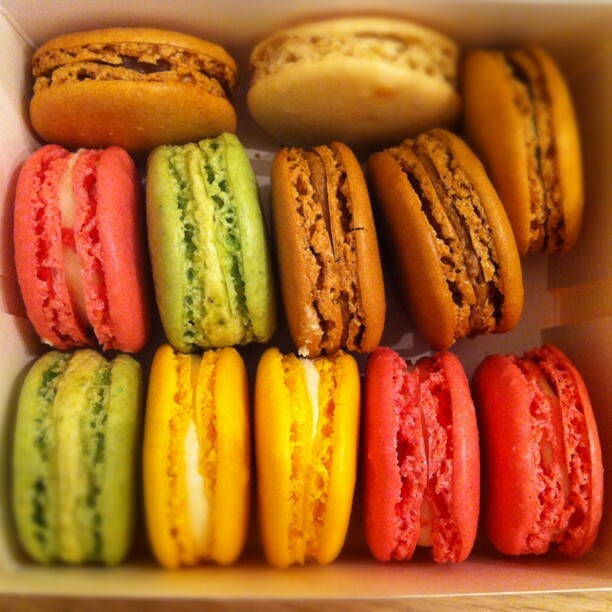 A number of great sweets were consumed on our trip to Italy, but the following were my favorite. Unfortunately, I cannot for the life of me find the name of the bakery in Rome from which I had the amazing sfogliatelle. But I have a picture of the lovely man who made them! 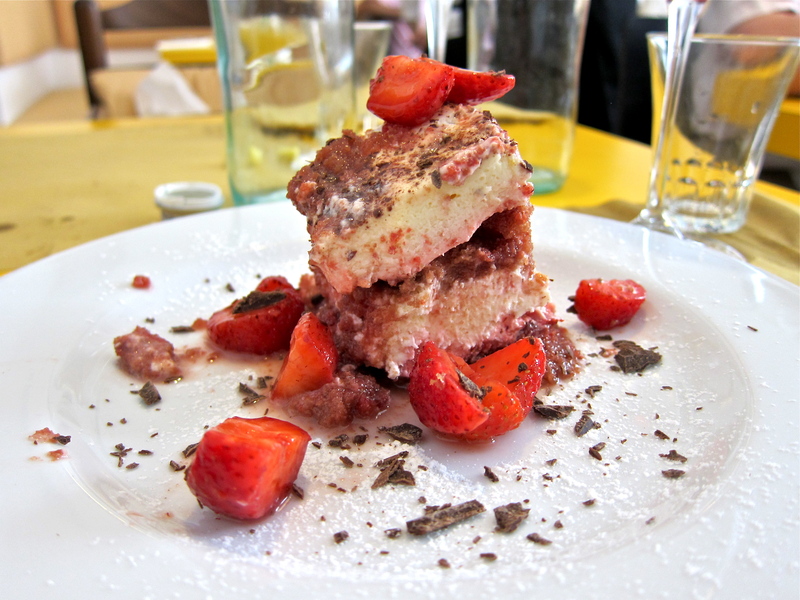 Also excellent was a simple dessert of two components from Trattoria da Teo, which serves rustic dishes in Rome’s Trastevere neighborhood. It was so good we ordered a second. 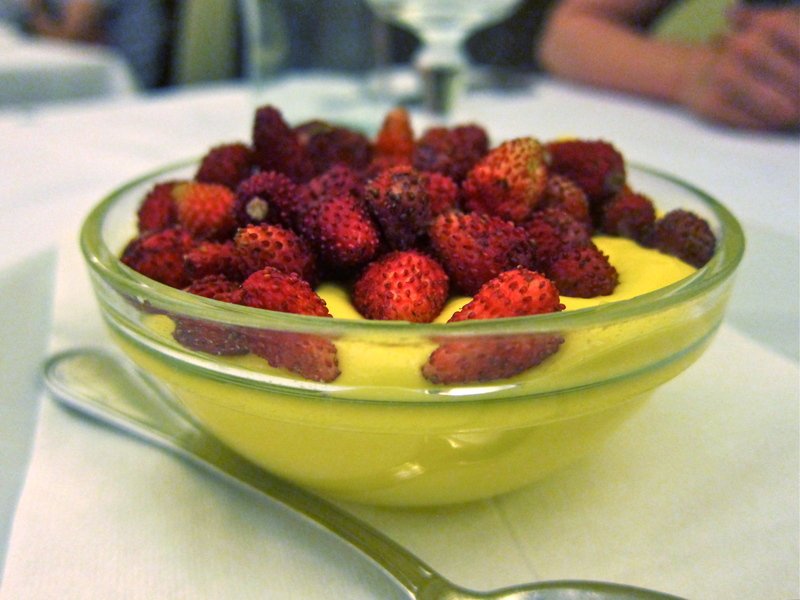 My other favorite restaurant dessert from Italy also contained cream and berries and came from L’Asino d’Oro, home of one of Rome’s best-value lunch menus. You can read more about the meal here. I didn’t expect much from the description of the odd-sounding ‘Strawberry Tiramisu’, but the proof in this case really was in the pudding. One of the most satisfying desserts of the year came from Dinner by Heston Blumenthal, its second appearance in this year’s round-up. 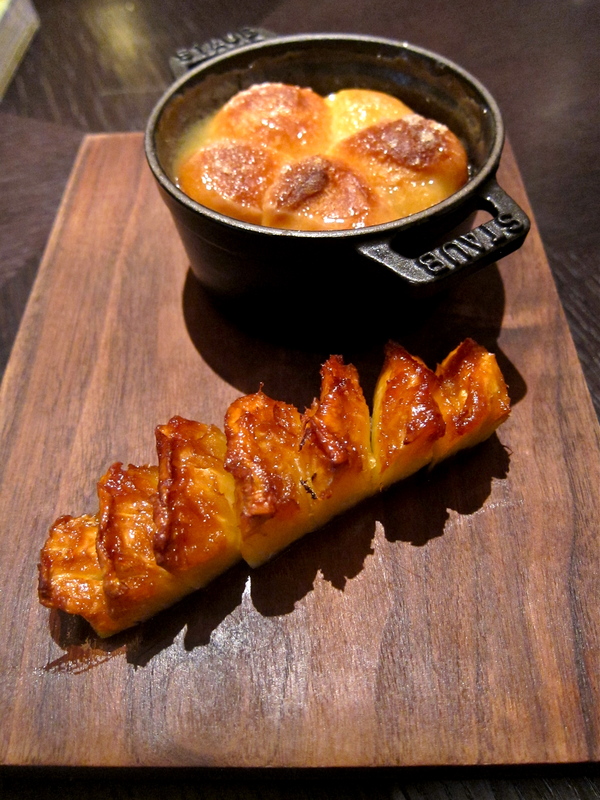 It was essentially a brioche and butter pudding with brandy, with the addition of one of the most meticulously roasted pineapples you are ever likely to find. You can read a full description in my review of this meal here. My favorite apple pie comes from Mrs. London’s in Saratoga Springs, NY. Wendy (aka ‘Mrs. London’) makes it at the bakery, but also serves it at her son Max’s restaurant next door. 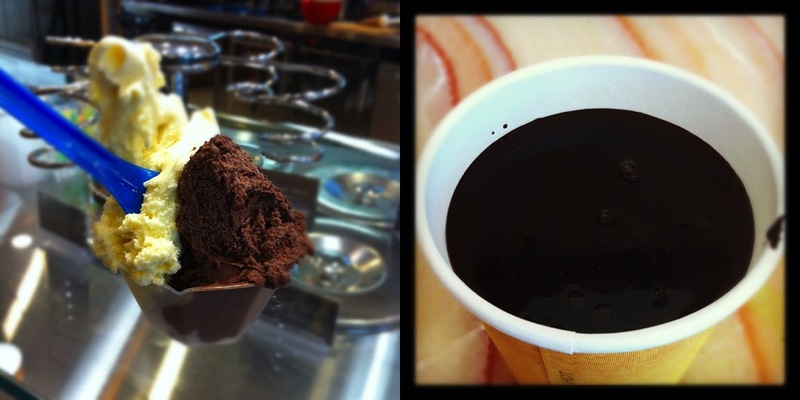 The ice cream is homemade too. Both places are worth visiting if you’re even in Saratoga for the horse racing or other reasons. 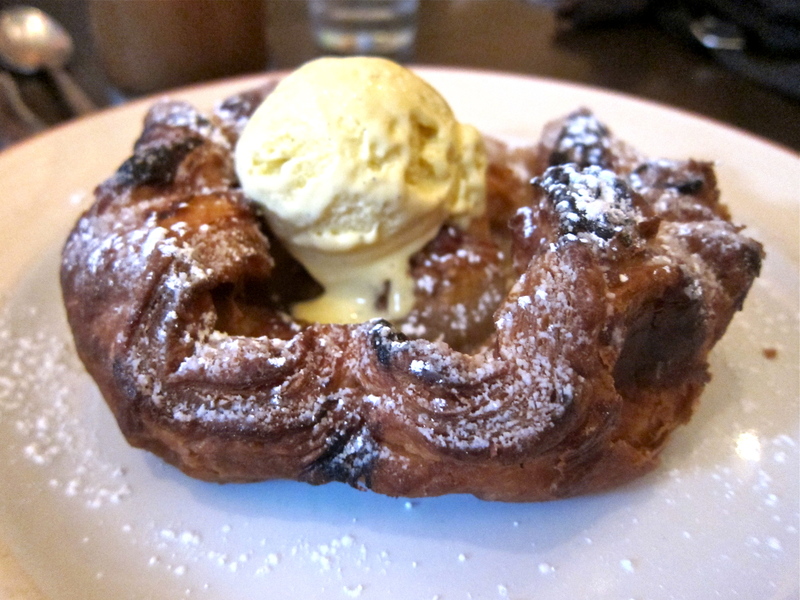 The bakery also serves a very worthy version of Kouign Amann. 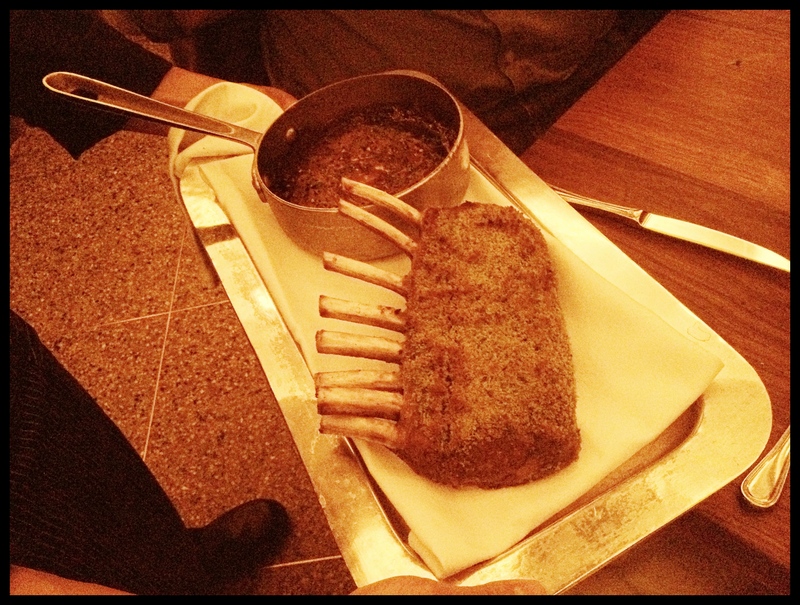 One the most surprisingly good sweet things I ate this year came from Commerce, which served the rack of lamb I mentioned above. I have never had a coconut cake I particularly liked, but the name of the dish speaks for itself, and is not incorrect, at least in my own experience. 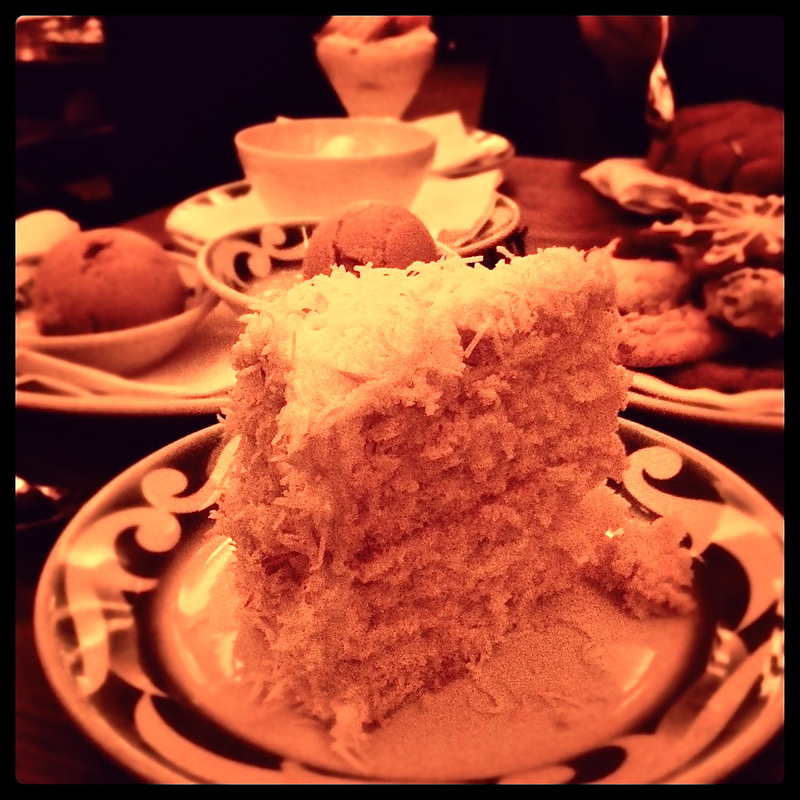 Its moniker is simply ‘The Best Coconut Cake’. While it carries a price tag of $10, it is money well spent. Sadly, I don’t have a great picture, but you can get the general idea from the image below. It has the perfect consistency and is not overly sweet, the main problem that affects most examples of this cake. 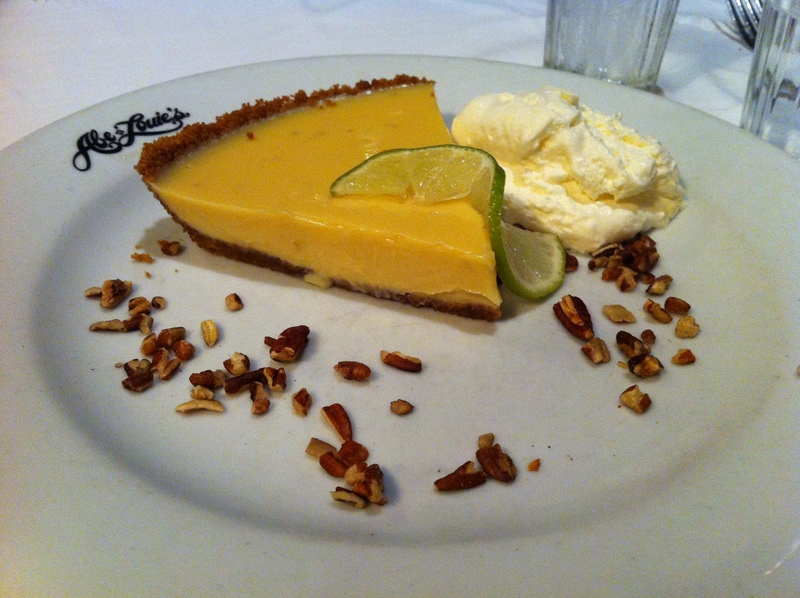 As a testament to the fact that great things often come when you least expect them, one of the best key lime pies I’ve had comes from a small steakhouse chain whose Boca Raton, Florida branch I visited twice in the last 12 months or so (the other location is in Boston). It was just as good on both occasions, the secret being that they (of course) use real Key limes and also make a delectable graham cracker-esque crunchy crust. If you ever go, their bone-in filet mignon is pretty darn good too. 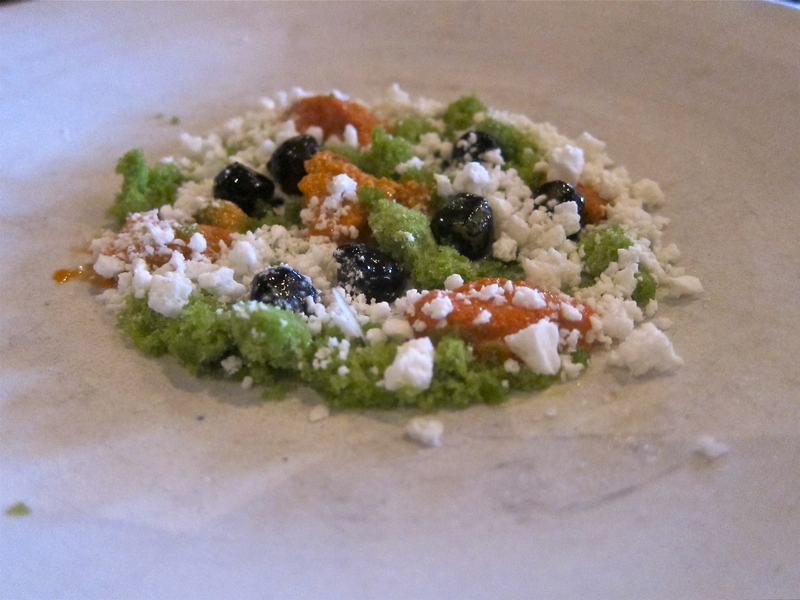 As it is getting cold now, I am reminded of a part-frozen dessert I had while in Copenhagen. 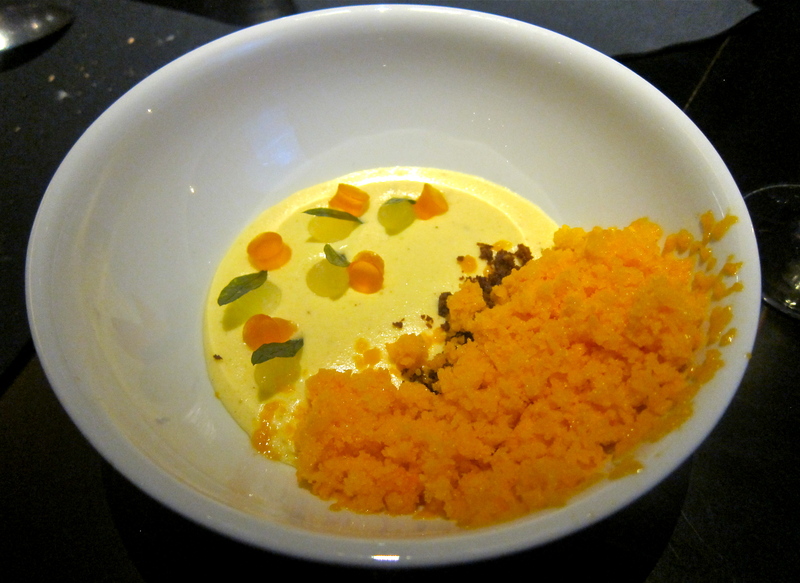 It was my final course at Kødbyens Fiskebar, which consisted of sea-buckthorn as both a grainté and gel, with a base of crème made from tonka nut and white chocolate. The tart and creamy contrast was perfectly judged. You can read the full description here. Most of the wines listed below are not particularly pricey (though all is relative), so I particularly enjoyed discovering them as I can afford to buy them again in the future. There were a few precious – in both sense of the word – bottles that I enjoyed on special occasions, but these were mostly the exception this year. Now that I have a proper wine storage solution, thanks to the impressive Liebherr unit that arrived on my birthday courtesy of my generous parents, I have been buying a lot more wine as of late. I have also found that I’ve been buying a lot of my wine online, through excellent new sites such as Lot18 (click here to join, it’s free). There are also a number of excellent wine merchants I frequent, including Zachys, Sherry-Lehmann, Chelsea Wine Vault, Tarry Wine Merchants (which adjoins to the aforementioned Tarry Market) and the extremely competitively (online) priced Rye Brook Wines. Frankly Wines is also a great little shop, but I rarely get downtown to visit. I am not the world’s biggest lover of, or expert on, beer (by a long shot) but my friend recently introduced me to the Three Philosophers, which is quite nice. I hope you enjoyed my review of the best bites & sips from 2011 and look forward to keeping you up to date on my findings in 2012 and beyond! Flattr moi? Why thank you. All content on https://laissezfare.wordpress.com is licensed under a Creative Commons Attribution-Noncommercial-No Derivative Works 3.0 England & Wales License. Can We Live 150 Years?